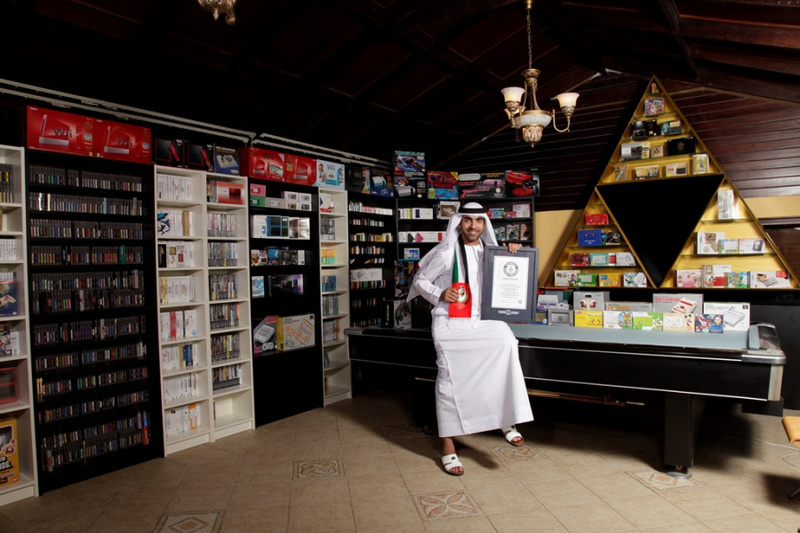 In 2014 Ahmed Bin Fahad made headlines when he received the Guinness World Record honour for the biggest Nintendo collection. Consisting of over 8000 pieces, it's an impressive range that shows his love for all things Nintendo, with the estimated cost coming in at around 1.5 million dirhams - the United Arab Emirates currency - which is over $400,000. We're always interested in learning more about the most passionate collectors, so we caught up with this Nintendo superfan to learn a bit more about how it came together, and how well known Nintendo is in the UAE. My Name is Ahmed Bin Fahad, I was born in 1981 and I have a Masters degree in International Business. When did you first get exposed to the world of Nintendo, and what was it that turned you into such a big fan? I was exposed to the world of Nintendo in 1986, starting with the Nintendo Entertainment System and Famicom system. As a child, I was just like every other youngster who loved video games and liked being up to date with them, but that slowly developed into an extreme obsession where I saw myself collecting, organizing and storing everything I bought. What prompted you to start collecting Nintendo games in this way? It all began 20 years ago when I automatically started asking my parents to buy me the latest consoles and the latest games. Although I used to get them occasionally as presents, I made sure the old ones I had were stored in their boxes and were kept in a safe place; then I realized that I was obsessed with Nintendo. A thought came to my head of collecting some clean copies of the old games of my childhood, as their memories are close to my heart. Therefore a thought came to my head of collecting some clean copies of the old games of my childhood, as their memories are close to my heart. Which is your favourite Nintendo system to date? How did it feel to get the Guinness World Record for your collection? Can you tell us a bit more about this? The idea of joining Guinness World Records only came to me a year ago, when my friends brought up the subject of getting the Guinness World Record as a joke, and it kept on my mind for a while; then I started thinking of getting serious. Moreover, getting the Record made me happy and proud. How prominent a brand - and how popular - is Nintendo in UAE? Nintendo is well known in the UAE today, since the 1980s. How much would you estimate you have spent on your collection so far? Have you had to travel outside of UAE in order to collect some of the rarer items in person? So far I think I most have spent not less then 1.5 Million AED. Yes I have travelled to various countries such as Japan, Singapore, Germany, Italy, Turkey, USA, France, Malaysia, Thailand, India, and Switzerland looking for my collectables. Can you tell us about the Triforce shaped shelves and the location for your collection? How much of the collection is on display and how much is stored away? The Triforce Shelves I got made and customized locally, and it's in my residential premises; those Triforce shelves only contain my Zelda items, and not even all of them. We understand you have a rare Nintendo M8 Demo Unit. Can you tell us a bit about this treasured possession? Yes, I do have the rarest M8 Demo Unit (not only one unit but two demo sets), which makes me feel proud to be its owner; I used to buy those rare systems from various countries. Video Games are fun, and collecting them is even more fun. Don't think purchasing games is a waste. Which item in your collection, other than the M8 demo unit, are you most proud of? It makes me feel proud to have the Nintendo Game Boy Advance SP with Miyamoto-san's signature, other than that I have my rare demo system, the Sharp Famicom Station. Aside from collecting games in factory sealed condition, we understand you often buy a second copy to play. Do you feel it is important to experience the games as they were intended rather than just have a box on a shelf? Sometimes yes I do feel it is very important to experience the game, especially when it comes to first party games like the Zelda series, Mario Series and Metroid Series. Is there a vibrant retro gaming collection scene in the UAE, or do you feel that it's rare in the country? Lately, after achieving my Guinness Record a lot of young generations have being inspired by it and started collecting the retro games. Video Games are fun, and collecting them is even more fun. Don't think purchasing games is a waste. I never felt like throwing out or discarding my old games, which finally made me a proud Guinness Record Holder. We'd like the thank Ahmed Bin Fahad for his time. awesome collection but the thing i want the most is that triforce shelf. Forget collection size, I'd just like a video game room like that! It's so nice to see someone love Nintendo, and video games, this much. Real gamers are, generally speaking, very nice people. That guy has a Triforce shelf. Great questions, and a fun piece, just wish he would've given a better response! wow. what an awesome collection! I love his Triforce shelves, and having a Miyamoto-signed GBA-SP is amazing!!! Must be a slow news day if we're reporting on 2014 stuff again. Maybe it's in between time for this and another lousy eShop game review. I Learned My 123s this time I bet. It is just amazing to see someone who loves Nintendo this much. It just brings a smile to your face seeing this kind of devotion and pride. Also wow that game room is just marvelous and just amazing! @zdog I think it is a bit of a language barrier at play. this is kind of inspiring. While I don't have anywhere close to the money needed to get a collection like his, maybe I can try something a little bit smaller. Should I go with Atlus games?or maybe Silent Hill memorabilia? Or FromSoftware games? Akumajō Special: Boku Dracula-kun now. Anyway, nice article. Though it felt a bit short. I wanted to see or hear more about the collection. YouTube game room tour now please! I would love to spend a day going through collections like this. Not just for nostalgia but also to see the many items I never even knew existed. @Utena-mobile I try and collect many of the Nintendo published games myself (doing Wii U and 3DS now, but I've done it going back to DS and GameCube). I generally only get the games I'm interested, and I play them too, just making sure I keep them in mint condition. This keeps things manageable and affordable, but they hold their value fairly well too if I ever need to sell any of them. Picking a particular developer/publisher you like is a really good idea, go for it! @GravyThief yeah! it seems like a lot of fun! Thanks for the encouragement. I'm off to look at my own collection for ideas. Golden coins & Rupees well spent! Cool collection, wish we could see more of it. Good job though Ahmed. I sold off my collection before I was married several years ago and then started buying and collecting again with my kids. It's a hobby and an obsession that I can share with them and something I enjoy in my free time. Like all other Nintendo fanatics, I've come to accept that I'm obsessed and am okay with that. DAAAAAAAAAAAANNNNNG.....that's a lot of Nintendo stuff, I don't think I'll ever have enough room to have a collection this impressive! I thought, what's with the triangle shelves in the first pic? I am still having high hopes for this forum post I made a while back, as it very much relates to Nintendo's horrid market share situation and poor localisation in the Middle Eastern region. Wow! What a great collection! What are some of your favorites to play? I feel for you. It's like that everywhere now though. Not to such an extreme degree in USA or Japan- especially pertaining to 3DS (very popular handheld in colleges here- everyone plays Pokemon it seems) but Nintendo just isn't all that that popular anymore. But that's ok. Nintendo doesn't have to be popular for us to love playing their games! There's going to be a lot of slow news days between now and the NX reveal. I'd advise getting comfy and used to it now rather than later. Surely two screenshots of the same section of his game room can't represent 8,000 pieces of game merchandise. Show us more, please! @peeks I know exactly how you feel. It's hard to be a socially-acceptable video game fan when everyone around you only cares about how their particular game purchases make them look to their friends, instead of caring about the principle of the matter: how fun and charming the game actually is, even when others say it's "uncool". At least you can expose your friends to Nintendo and other real game company games whenever you hang out with them, though. @Utena-mobile Ooh hey a fellow Utena fan! I used to frequent the anime forum on here a lot - in fact it was that forum that was hugely responsible for me getting seriously into anime in 2013. I might go back at some point ha. Still - great to see people who love that show. When I am rich, I will build a collection that leaves him in the dust. Mark my words. @Rocko52 Hey why not Saionji? Is it because he is too fabulous? @Wexter Oh don't worry - Saionji's pretty lovely too. I just loved this look Touga gave way back in episode 1. He was watching Utena's first duel through a freaking opera glass & said something like "Oh you light my fire baby." That moment was just too amazing. That's awesome that he enjoys it; more power to him. very cool Tri-Force shelves. I'd only collect the things I truly love and/or have fond memories of. There's just no way people who have walls and walls of --say NES games, can honestly say they like every single one of them. It is crazy how popular Nintendo is everywhere! Really jealous when I see people with collections as great as these! I wonder if will become important for Wiis and Wii Us to have "Complete Digital collections" on them for future resale and purchase. Like, a Wii U loaded with every eShop title on it has the potential to be more valuable than a factory sealed standard Wii U. That is a great collection, it is always nice to hear from other Nintendo fans! It is a shame that Nintendo seems to be less relevant in gaming nowadays. I know a collector who has all that retro stuff including an m8. He could very well challenge his record. I would never be able to finish all that. Nice collection!! And good to hear good news from that side of the world. @zdog To be fair, his English is pretty decent Whenever we send questions to interviewees outside of the UK / North America there's always an acceptance that, with English being the second language, people can only do their best with answers.